In 2008, game designers Will Hindmarch and Jeff Tidball released a very useful book entitled Things we Think About Games. The book contains 101 statements by the authors, with a couple of additional statements by guest gamers/designers. Some of the comments are common sense, some are blunt, and all are thought provoking. Things We Think About Games is a book that belongs on every gamer's bookshelf, and Will and Jeff's website belongs on every gamers rss feed. At the San Diego Comic Con this year, I asked Jeff Tidball if he would allow me to write a series of posts featuring the statements from the book. Each blog post would be a gamer reacting to one of the statements in the book, and eventually I'd like to address all the statements made by the various game designers. I will also continually belabor the fact that Will and Jeff asked Wil Wheaton, and not me, to write the introduction to the book. While this is a common mistake, it is one that I will point out at every opportunity. Yes, Wheaton is more famous (and is in Secret of Nimh which I recommended as last week's Hulu recommendation), but I am less likely to use expletives. This being a blog, and not a Thesis or Dissertation, I will address the statements in no particular order, but I do hope to address them all. Today's blog topic is inspired by the 101st entry in the book. Know Why You Play Games. The statement is simple enough, and is a gamer's version of Oracle of Delphi's famous dictum Gnōthi sauton or "Know Thyself." It is a statement seems to have an underlying claim that some ludophile Socrates might adhere to, "the unexamined gaming experience isn't worth playing." That may, in one way, be the whole point of Hindmarch's and Tidball's book, but this quote provides a nice starting point for any discussion regarding games and spurs one on to think philosophically about the subject. It was this thought that was lurking around my subconscious when I read an article at Gamasutra about Robotron 2084. The article is an historical article about the game and its legacy with regard to game play. A good amount of time is spent discussing the games innovative use of a two joystick system, an innovation that couldn't be accurately emulated in a "home experience" for many years. It makes for interesting reading, but there was one quote which mixed with STATEMENT 101 to inspire me to think about why I play games. The quote was a simple one, "The player is tasked with the grim, desperate, and ultimately futile task of saving the last family of Humanoids (emphasis added)." Ultimately futile -- the words echoed in the back of my mind. Why would I want to play a game that I cannot, no matter how skilled I get at it, "win?" What particularly bothered me about this statement is that it pointed to a contradiction in my game playing habits. 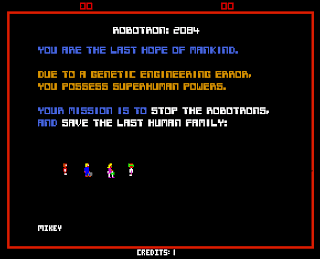 I have been a fan of Robotron 2084 for decades and have played it uncountable times. In that time my skill level has migrated, from poor to excellent to poor to average, depending on how often I have played the game during a given time period. I am not always in the mood for Robotron, but I never find the game -- as it was designed -- to be a bad game. As big a fan as I am of this particular futile effort, I was seriously disappointed by the end of Dawn Of War . After many hours of game play, and total victory over the forces of Chaos, I watched as all my hard work evaporated in a "1970s Satan has eaten your soul Bad ending" as my Space Marine Captain unwittingly released a new demon into the universe. The futility of all my hard work playing Dawn of War was made clear to me during the final animated narrative sequence. Lucien Soulban's scripted ending undid everything I had struggled for in playing the game -- and it seriously aggravated me. I was all the more aggravated because an author/game designer I respect was the one who dropped the "futility bomb" on my head. Why was I experiencing such a strong emotion that was, on its face, a contradictory sentiment to my thorough enjoyment of the equally futile Robotron 2084? To answer this, it was helpful to contemplate statement 101. I play different games for a variety of reasons, but one reason that keeps me coming back is "story." I like the way that games, of all kinds, tell stories. It's one of the reasons I am a "good loser." I don't mind losing to someone who is better than me at Chess, all I want is my learning experience to be a good story. Candyland, with its pre-determined gameplay, taught me the importance of story in play and de-emphasized "winning." Both Robotron 2084 and Dawn of War contain story elements. Robotron's appear to be "weak" at first, but they are deeply embedded in gameplay -- if simple narratively. Both games contain narratives where the actions of the player, in the end, result in failure -- so there must be some element of the game and how it interacts with story that allows me to enjoy one in its entirety while feeling dissatisfied with the ending of the other. Aha! It isn't the futile ending that is disappointing. It is the fact that the futile ending was not a part of game play -- it was a forced narrative tacked on to the end of the game. When the player inevitably loses in Robotron it is because the game has finally become too hard to finish, the game has literally beaten you. When you "lose" at the end of Dawn of War, it occurs after you have achieved "final victory." The contradiction lies in the interaction between the mechanics and the story -- a contradiction made even stronger by the underlying expectations of Real Time Strategy games. The underlying expectation of an RTS is that you can win, any advantage in supply or troops the computer opponent has is usually made up by an imperfect AI -- necessarily imperfect as a perfect AI would likely win all the time and lessen the fun. Would I have felt differently if I had actually lost the final scenario of Dawn of War rather than have a scripted 70s ending? Not if the game had followed standard RTS genre conventions, the player "must" have a chance to win in the conventional. If the game progressed in a manner similar to other RTS games, each level getting slightly more difficult but winnable, with a final impossible level, the game would have likely been as unsatisfactory. This dissatisfaction would likely have been accentuated by the interstitial narrative clips. On the other hand, if the game lacked interstitial clips and the narrative left only to game play I would probably have accepted an unwinnable level. At least possibly, especially if I knew going in that the game eventually becomes unwinnable as each level becomes more difficult than the last. But that isn't the central conceit of an RTS campaign, the central conceit of an RTS campaign is that the player is unlocking a heroic narrative. In this case, each victory leads to a new chapter in the hero's tale. A hero can hit a low point, like the one at the end of Dawn of War, but that ought not be the end of the story. In this case, it is. There is no sequel to the narrative, though there are many sequels to the game. My Blood Angels forever stand defeated in their victory, where my mutant defender of humanity just ends up dead after finally facing overwhelming odds. I think it would be interesting for someone to design an RTS where each level becomes more difficult than the last, with no end in sight. Then the story changes from how my victory was taken from me, to how far I was able to get and who is able to get to the farthest level. I think I might prefer traditional RTS games -- with victorious endings -- to that "futile" RTS, but given my love of Robotron 2084 I'd probably like that killer RTS more than the end of Dawn of War because the ending would be driven by the mechanics of the game. I don't mind losing when it's a part of the rules, but I hate losing when I won fair and square.